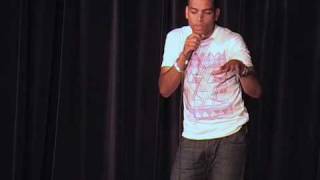 The younger brother of bestselling author Zadie Smith, Doc Brown is a rapper who turned to stand-up in 2007, and was a finalist in the So You Think You're Funny new act competition the following year.He was placed third in the English Comedian Of The Year competition 2009. In 2006, Brown featured in the BBC Radio 4 show Do You Know What You Are Saying?, about the English language presented by Melvyn Bragg, and he acted as a consultant on Lenny Henry's Radio 4 comedy Rudy's Rare Records. Sorry. We have no listings of forthcoming performances by Doc Brown. We do not currently hold contact details for Doc Brown's agent. If you are a comic or agent wanting your details to appear on Chortle, click here.